Australia's Peter Goddard (born 28.6.64) has established himself as a consistent performer in international road racing competition for more than a decade since the late 1980s. Goddard's past performances are highlighted by winning the World Endurance Championship title in 1997, the All-Japan 500cc Championship in 1991, and the Australian Superbike Championship in 1996. His career results include race wins in the World Superbike Championship, the All-Japan Formula One Championship, and two podium finishes in the Suzuka Eight-Hour endurance event. In the World Superbike Championship he has raced for the factory Yamaha, Suzuki, Kawasaki, Aprilia, and Benelli teams. Goddard also made 17 starts in the 500cc world championship between 1990-97, with a best result of fifth in the 1992 British Grand Prix at Donington Park. He raced for works Yamaha and Suzuki 500cc teams. When in Australia Goddard lives at Wollongong, in New South Wales, but he is based in Europe for most of the racing season when competing internationally. During 2001 he married long-time partner Kim, and they have a daughter, Demi-Anne. 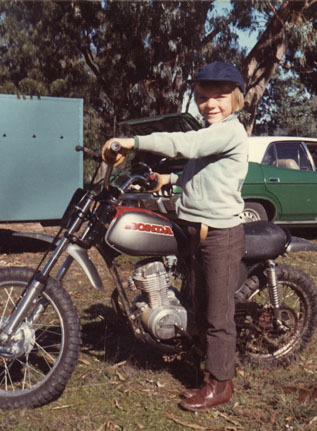 Goddard began riding motorcycles at the age of five on a Honda Z50, and he first won recognition in Australian racing as a teenage dirt-track rider. He won the first of his four Australian Dirt-Track Championship titles in 1982 in the 125cc class, and in 1985 travelled to the United States and raced in the Camel Pro flat-track series. After returning to Australia in 1986, he won three Australian Dirt-Track Championship titles, including the 500cc and 250cc classes. Goddard made his road racing debut at Oran Park near Sydney in 1984 when at the height of his dirt-track career. He fitted a set of road racing tyres to a motocross machine for the meeting. In 1987 Goddard made his first major commitment to road racing when he bought a Yamaha TZR250 to contest 250cc production events. He had immediate success, winning the 250cc production race at Australia's most prestigious race meeting, at Bathurst at Easter. Toward the end of 1987 Goddard moved up to superbikes, and won the "Rookie of the Year" award in the Swann Insurance International Series. Goddard was based in Japan in 1988 and rode a Moriwaki in the All-Japan Formula One Championship. In 1989 Goddard joined the Marlboro Yamaha Dealer Team for superbike races in Australia, and selected events in Japan. He had spectacular success, winning the Australian round of the World Superbike Championship at Oran Park, and the Superbike Challenge support race at the inaugural Australian Grand Prix at Phillip Island. Goddard's overseas results in 1989 included winning the final round of the All-Japan Formula One Championship at Tsukuba on a works Yamaha YZF750. He also finished third in the Suzuka Eight-Hour event that year on a Yamaha OWO1, riding with Japan's Shingo Katoh. In 1990 Goddard again rode for the Marlboro Yamaha Dealer Team in Australia, and was second in the Australian Superbike Championship. He won the Australian round of the World Superbike Championship for the second successive year, after the event was switched from Oran Park to Phillip Island. During 1990 Goddard made his 500cc world championship debut in the Australian Grand Prix at Phillip Island. He rode a Marlboro Team Roberts Yamaha YZR500 and finished a creditable eighth. In Japan in 1990 Goddard won the final round of the All-Japan Formula One Championship at Tsukuba on a factory YZF750, and also finished third in the F.I.M. Cup TT Formula One race at Sugo. Goddard joined the Japanese-based Team Hayashi in 1991 to contest the All-Japan 500cc Championship on a Yamaha YZR500. He clinched the Japanese 500cc series title with a brilliant victory in wet-weather in the final round at Tsukuba. In addition to winning the 500cc title, Goddard's 1991 Japanese results included winning the Suzuka 200 on a Yamaha YZF750. His performances in Japan in 1991 led to him moving up to the 500cc world championship in 1992 on a privateer ROC-Yamaha. Goddard was the leading privateer in the 500cc world championship in 1992, with four top 10 results - fifth at Donington Park in Great Britain, sixth at Jerez in Spain, eighth at Shah Alam in Malaysia, and 10th at Hockenheim in Germany. In 1993 Goddard joined the factory-backed Lucky Strike Suzuki team to race a RGV500 in the All-Japan 500cc Championship. He won the fourth round of the series at Suzuka. Goddard's victory at Suzuka meant he had won at least one 500cc or Formula One race in Japan in 1989, 1990, 1991, and 1993. Goddard returned to Australia in 1994 and joined Ansett Air Freight Suzuki superbike team. He won races in the Australian Superbike Championship at Phillip Island and Wanneroo, and was fourth in the series. The following year (1995) Goddard became team manager of Ansett Air Freight Suzuki, while continuing as a rider and finished second in the Shell Superbike Series. He retained both positions (rider and team manager) in 1996, winning the Shell Australian Superbike Championship, and Shell Superbike Series. In 1997 Goddard won the World Endurance Championship title on a works Suzuki. His results included victories in the Le Mans 24-Hour event in France and in the Spa-Francorchamps 24-hour race in Belgium. Goddard joined Suzuki's works team in the World Superbike Championship in 1998, and finished ninth in the series. He had 18 top 10 results from 24 races. His best race result was fourth at Phillip Island. In 1999 Goddard was recruited by Italian manufacturer Aprilia for its debut year of racing in the World Superbike Championship. Riding the fuel-injected Aprilia RSV1000 V-Twin, Goddard's best race finish was fifth in race one at the Nurburgring in Germany. Goddard decided to switch to Kawasaki for his 2000 racing commitments. He contested four rounds of the World Superbike Championship for the works team managed by German Harald Eckl, with best results of sixth in both races at Valencia in Spain. During 2000 Goddard also raced a factory Kawasaki ZX-7R in the Suzuka Eight-Hour World Endurance Championship race, and finished third with Japan's Tamaki Serizawa. In 2001 Goddard joined Italian manufacturer Benelli for its debut in the World Superbike Championship with the three-cylinder Tornado 900. Goddard competed in six rounds of the championship on the new Benelli, finishing nine races from 12 starts and scoring points three times.